They are wonderfully seasoned to enhance the natural flavor of the fines cuts of chicken breast. Blended by hand by our skillful taste artisans in our own kitchens, not in a scientific lab, we only add specially selected herbs and spices. 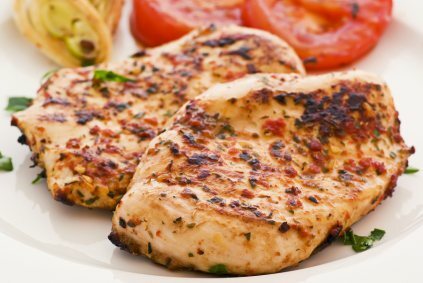 We start with only prime cuts of natural chicken breast which is free of animal by-products, growth hormones or antibiotics so you can be confident you are serving the finest quality product. We then artfully season the chicken with a balanced blend of herbs and spices that are there to enhance the natural goodness of the chicken, never overshadowed by sauces or concoctions. Rest assured that you are putting unsurpassed quality and expertise on your dinner plate. To enhance your meal with our Marinated Chicken Breast or to make them as a main dish, please follow our “recipes” link for instant meal ideas.